Steam Blancher - Cooler |Food Processing Equipment USA | Dixie Canner Co. It Steams, Blanches and Cools. This equipment saves time, space and money. It gives the food more natural color, more delicious flavor and more vitamins. The Dixie Steam Blancher-Cooler with the ALL-NEW WATER SEAL is needed wherever foods are prepared for canning, freezing or serving in quantity. Product is spread evenly without bruising or crushing in the smooth flat bed perforated trays for uniform steam blanching. The filled trays are placed in the blanching compartment and pass to the cooling compartment automatically when the next tray is inserted. This continuous performance guarantees unusually large production. Order several extra trays for increased production and handling ease. 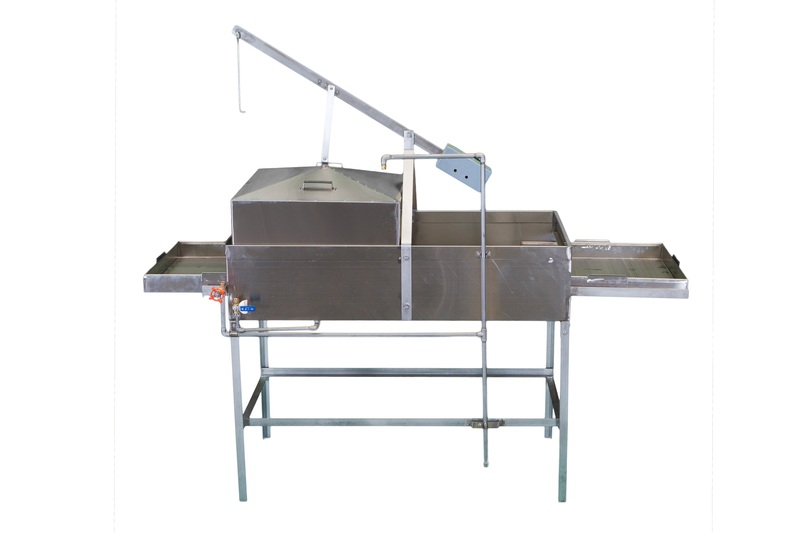 stainless steel construction – Request Price Complete with 4 stainless steel trays, 2 quick opening valves and ready arranged steam and water lines with cooling water spray nozzle. Shipping Wt. 300 lbs., Export 400 lbs., 77 cu.ft. powder-coated (subject to stock) – Request Price Perforated Bottoms. 24″ x 24″ x 3″ deep. Shipping Wt. 20 lbs., Export 30 lbs., 1 cu.ft.